I am betting you have thousands of photos on your computer, am I right? And let me guess, you love them all, right? I mean they’re of your baby – so naturally. But, how do you know if you have a MONEY shot in there? How can you possibility pick the ones you want to frame or put in a book? Here are the TOP 6 THINGS I think about when I’m editing through photos and deciding what belongs in the diaper genie and what is worthy of a frame or a spot in a book. To me, light is the most important part of a photograph. Photography means “light writing” so if the light is bad, yucky, dark or unflattering then there is little hope for the photograph. I’m always looking for light that is soft, even, flattering and creates great vibrant color. Light is something you can’t change in post-production and my time is too valuable to spend my life trying (and so is yours). The second most important thing that I look for is expression! I want smiles or an expression that conveys some type of emotion, or makes me feel a certain way when I look at it. I’m kind of a focus junky. I LOVE sharp photos. I rarely keep something that isn’t tack sharp unless it has EVERYTHING else going for it…(then I might consider it). I do look for composition when I’m editing, but it is definitely lower on the list. Composition is something that can be changed in post-production with creative cropping. I will often shoot for focus and then crop later for composition. I will keep an image if it works well with another image and helps to tell a story. This is especially true when I’m picking out images for a book. This is a little bit like the phrase, “Because I said so.” On occasion there is a photo that you LOVE – and you might have the words to explain why. Maybe the lighting isn’t perfect, maybe the focus is off – but you love it. In your heart of hearts, you just can’t hit delete. So turn it black and white and call it art. Because you said so. THANK YOU!! I needed this post! Especially after watching your videos and reading your blog! 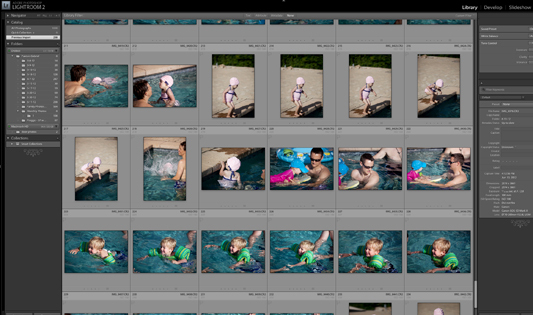 I now have a couple hundred photos a week of my little man to go through– and end up calling far too many “keepers”! I am already thinking of the looming task of making a first year book and need to start narrowing down or his book will end up being thousands of pages! These tips will be very helpful as I take a look back at his first months.